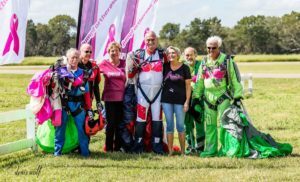 Jump For The Rose (a 501(c)3 non-profit corporation) welcomes all volunteers – whether you are a skydiver or not! If you would like to volunteer at any of our camps or the main event, please email marian@jumpfortherose.org If you have special skills you wish to offer, such as photography, sales or even emergency medical, please let her know. Volunteering your time is just one way to help out. How about volunteering your efforts to bring in community support through sponsorship? If you know of a company or group that would likely donate to, or join, our cause please contact us!